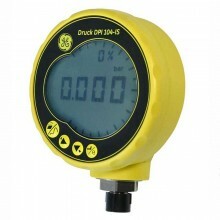 Includes: Calibration Certificate, DPI104 IS User's Manual and 9V Battery. To order with NPT connections or other pressure ranges not shown, please contact your nearest office. 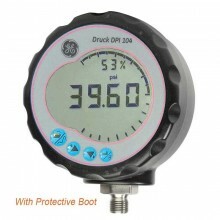 The GE Druck DPI 104IS is a microprocessor-controlled digital pressure gauge that combines precision and functionality in a compact, robust and simple-to-use package. The DPI 104 matches advanced silicon sensor technology with several convenient design features resulting in an accurate, versatile yet affordable digital test gauge. 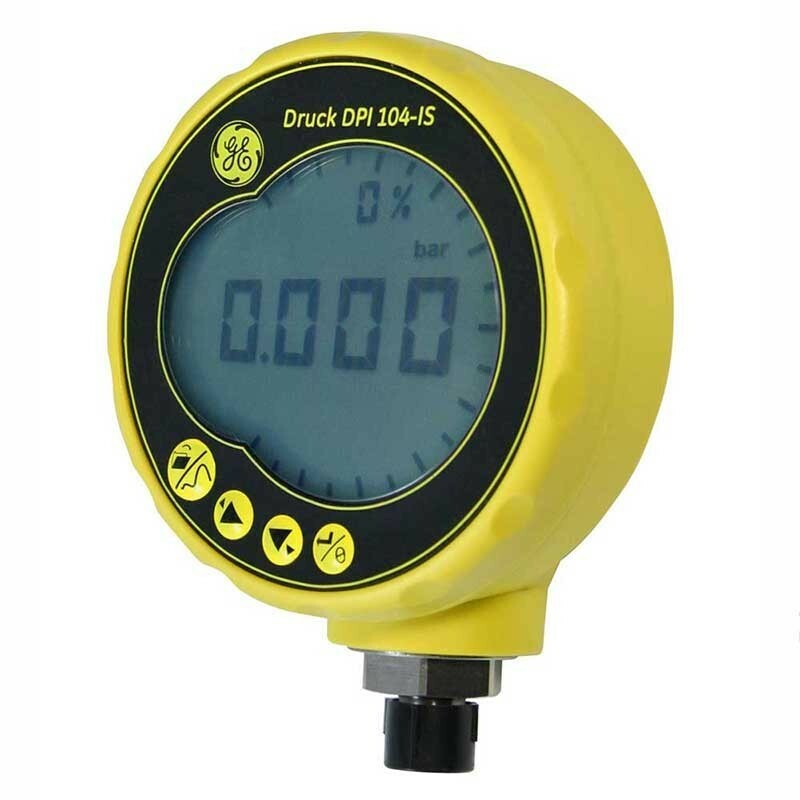 The Druck DPI 104IS test gauge measures the pressure of liquid, gas or vapour and shows the pressure value on a liquid crystal display (LCD). 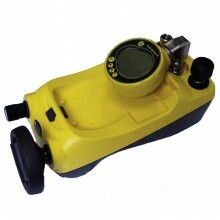 It also has the Intelligent Digital Output Sensor (IDOS) technology to use data from a Universal Pressure Module (UPM). The DPI 104IS can be programmed to provide a 0 to 5 V output signal that can be configured as directly proportional to the pressure shown in the display or set to a fixed value. The voltage output mode provides 0.1% FS accuracy from 50 mV to 5 V.
For added convenience, the DPI 104 housing will rotate 320° around the pressure fitting and the faceplate can be rotated in any orientation for optimum visibility. 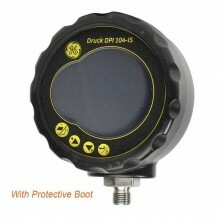 To guard against unauthorised menu access, the DPI 104 features a menu and tare lock function. Measure pressure - Accuracy: 0.05% full scale (FS). Large 5-digit main display with 11 pressure units. Adjustable Full Scale Output (FSO). 20 segment analogue dial in increments of 5% FSO, (large division marks = 10% increments). 2.5 digit percentage indicator (0-100% FSO). 8-pin connector port: For RS232, **IDOS UPM, external power supply. Alarm output for high/low pressure conditions. Switch input to monitor an external pressure switch. Other functions: Maximum/minimum, tare, Vout scale factor, automatic power off. NPT connections and other ranges available to order. * All gauge models can measure negative pressures (not part of the calibrated range). ** 0.15% FS for 10 psi (700 mbar range). Pressure Range to 300 psi (20 bar). 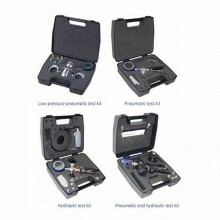 Selectable Pressure Units kPa, MPa, kg/cm2, psi, mbar, bar, inHg, inH2O, mH2O, mmH2O and mmHg. Storage Temperature -4°F to 158°F (-20°C to 70°C). Humidity 0 to 95% without condensation. Ingress Protection IP65 (Dust-tight, jets of water). Battery life up to one year for pressure measurements. Mechanical Vibration To Def Stan 66-31, 8.4 Cat III. Intrinsically Safe Certifications ATEX: II 1G, EEx ia IIC T4, IECEx: Zone 0, Ex ia IIC T4. Materials (Case) ABS/PC plastic sealed to Type 4/IP65. Dimensions Diameter: 95 mm (3.74 in); Depth: 55 mm (2.2 in). 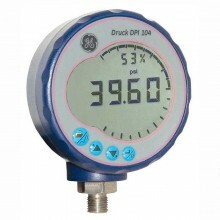 PDF Specifications of the Druck DPI 104 intrinsically safe digital pressure gauge.